Hello friends, today I am sharing a chic table especially set for Galentines. I love the dramatic look of black and white with hot pink! 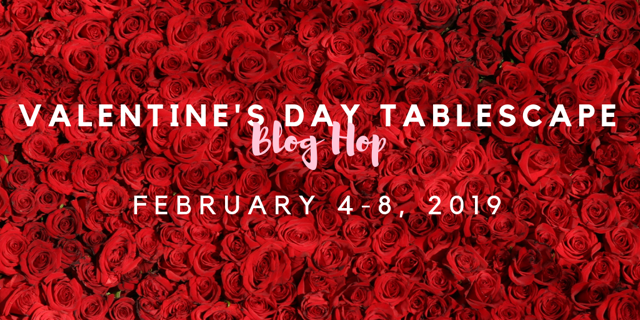 I am joining many multi-talented stylists on this Valentine's Day Blog Hop. 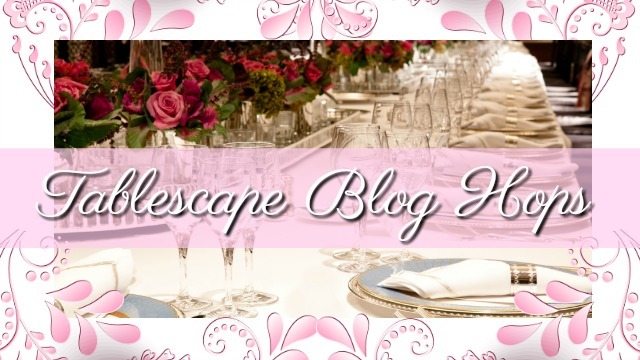 Be sure to check out the other tablescapes toward the bottom of this post. 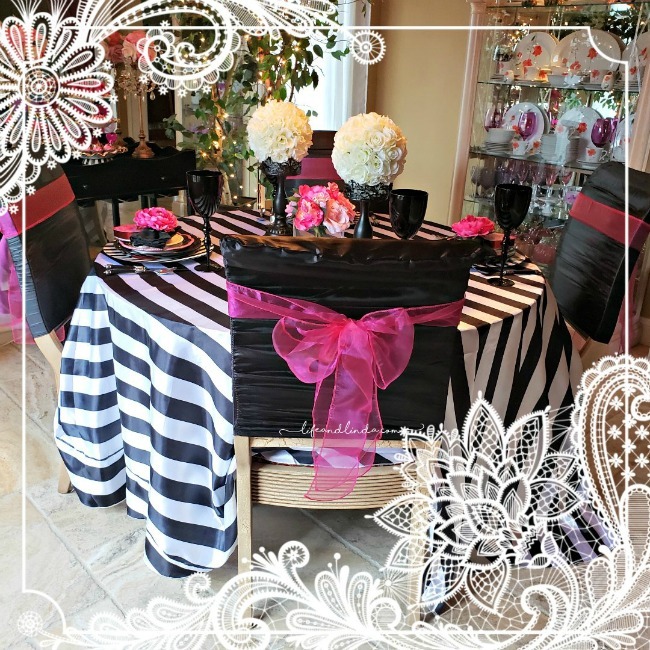 The black and white striped tablecloth is very inexpensive. A purchase from Amazon. The chargers from Michaels fit in nicely with this themed look. Add some black flatware and touches of hot pink and we are there. Gals love to party with pink. The black dinner plates are from the Dollar Tree. The plate stack include this fun plate...girls love....a little chocolate. Mini pink cupcakes sit nicely in my Mackenzie Child's Tiered stand. The black and white checkered look blends in beautifully. I added some hot pink hearts. My trusty black pillow cases slide wonderfully over my Breakfast room chairs. I added a hot pink chair sash to complete the look. 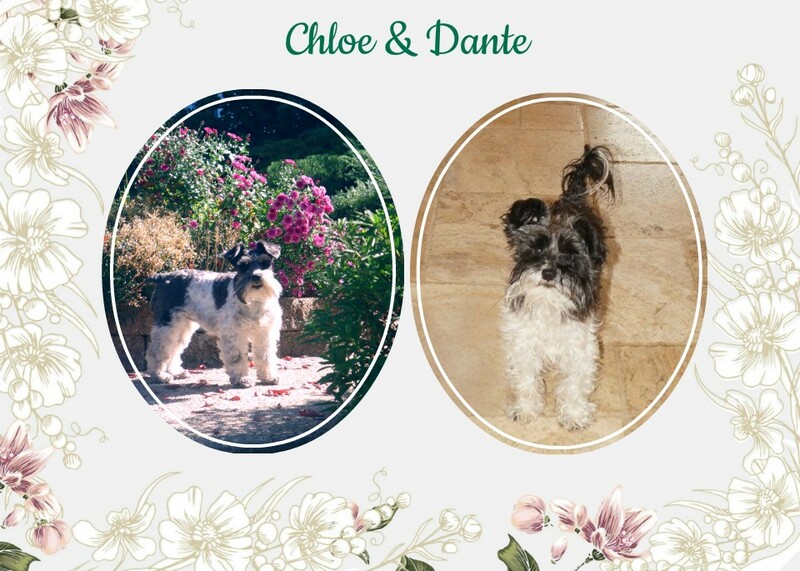 Many thanks to Chloe from Celebrate and Decorate for organizing these lovely blog hops. I hope we all have inspired you. Enjoy and have fun! Hi Linda, wow once again you have decorated a gorgeous table for Valentine’s Day. I really like the color scheme and everything about it. So much to look at, the cupcakes look so pretty. Girls will have so much fun. What girl wouldn't go for the glam if given the opportunity?! And with a group - all the better! Linda, you make diva dining divine! I love the dramatic contrast of black & white, and your pinks make it light & bright. A perfect table with the MKC pieces! Wow! Linda! Your table just pops out at you, saying let’s have some fun this Valentines!! Love all the stripes! Your MC tiered trays look fabulous with all your stunning pink deserts and florals. Love it❤️ Always a pleasure hopping with you!! How wonderfully dramatic! I hope you have a great meal with your gal pals. Chocolate definitely on the menu, those plates are too cute. Always a pleasure to blog hop with you. 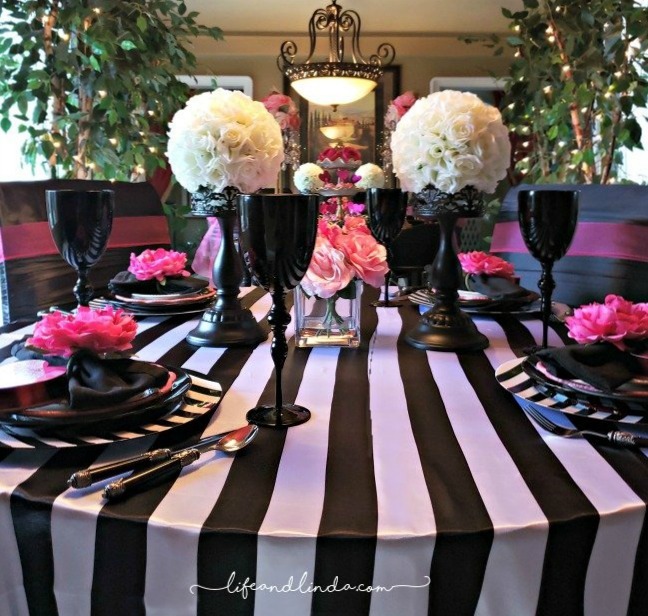 Linda, the use of black and white with hot pink gives a dramatic but feminine tabletop. I love those fun plates and of course, the MKC! I know that your friends will feel so special sitting down at this stunning table you have set. It is always a pleasure to blog hop with you! So pretty as always Linda. The plates are too cute. Love it all. Happy New Week. 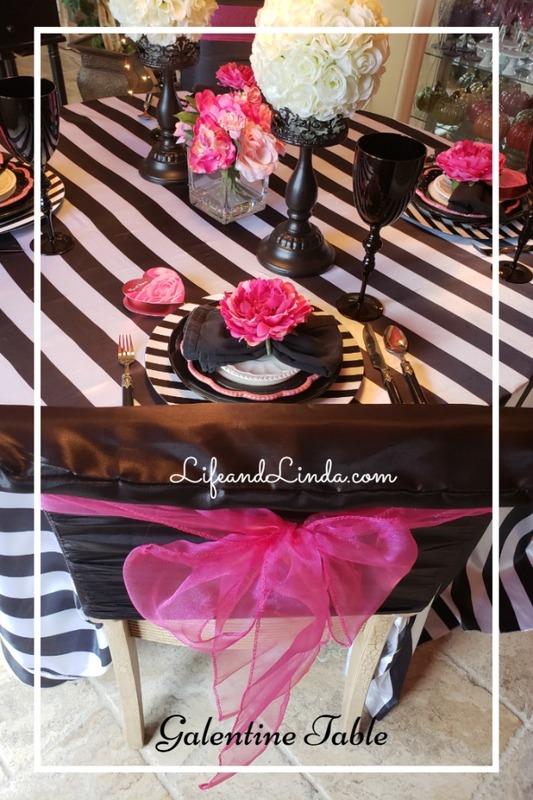 Oh, Linda, what a beautiful table with the black and white and the pops of hot pink! 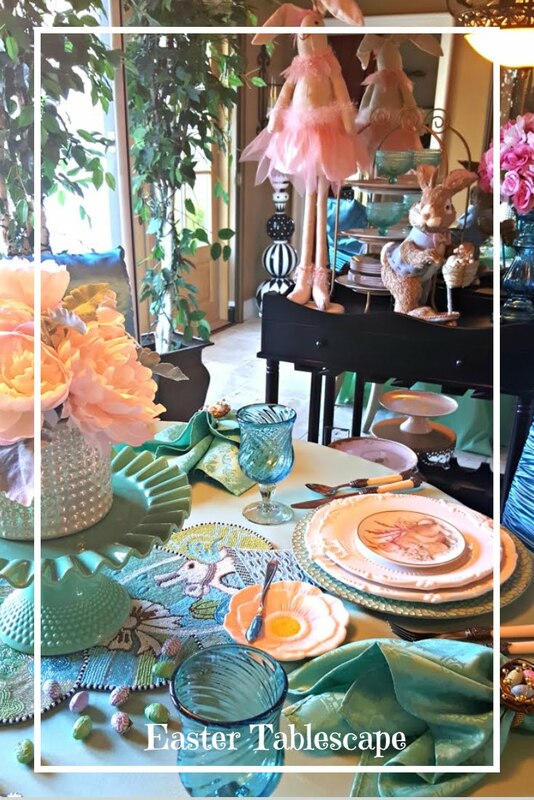 I know that any ladies would love to be hosted at such a fun table. The black stemware is tre chic! 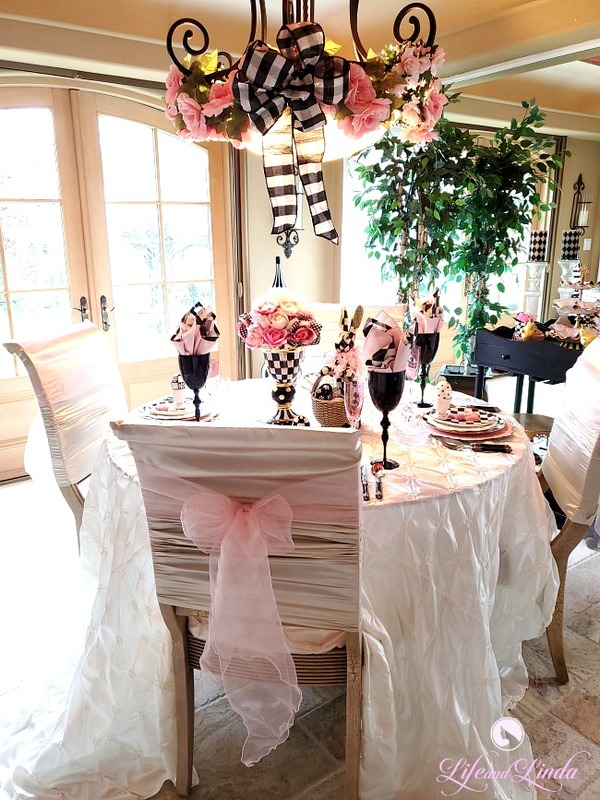 The MacKenzie Childs server is the perfect complement to your black and white celebration! Thank you so much for once again joining in another blog hop and sharing your amazing styling talents! Stunning, Linda! 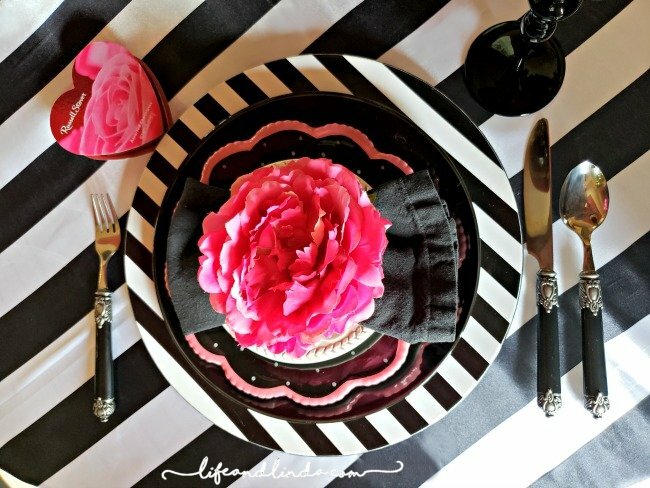 Love the dramatic black and white stripes with the luscious hot pink flowers. You make it look so easy. You are a great stylist! Great mix. 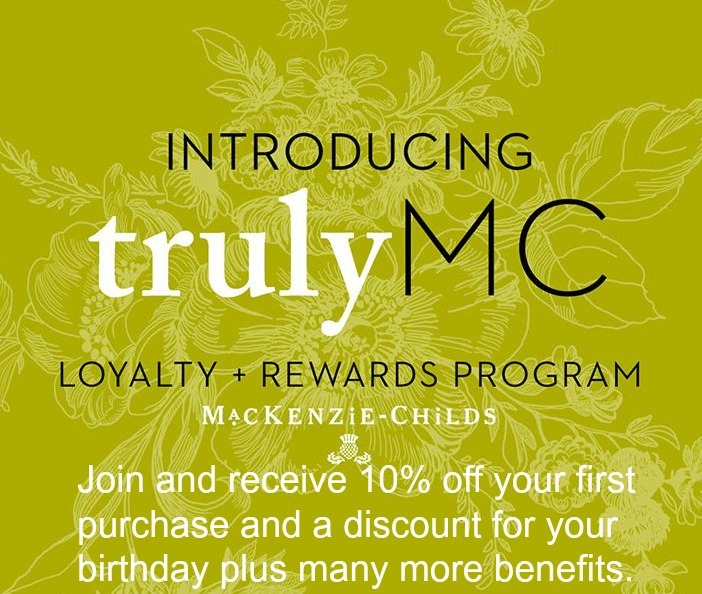 Love your MKC tiered stand! Please pamper yourself and rest. You never fail on these tablescapes. Love the simplicity of this black & white with a touch of pink. Sassy! Sassy! Love it. Bold and sassy and captures attention! My kind of table. 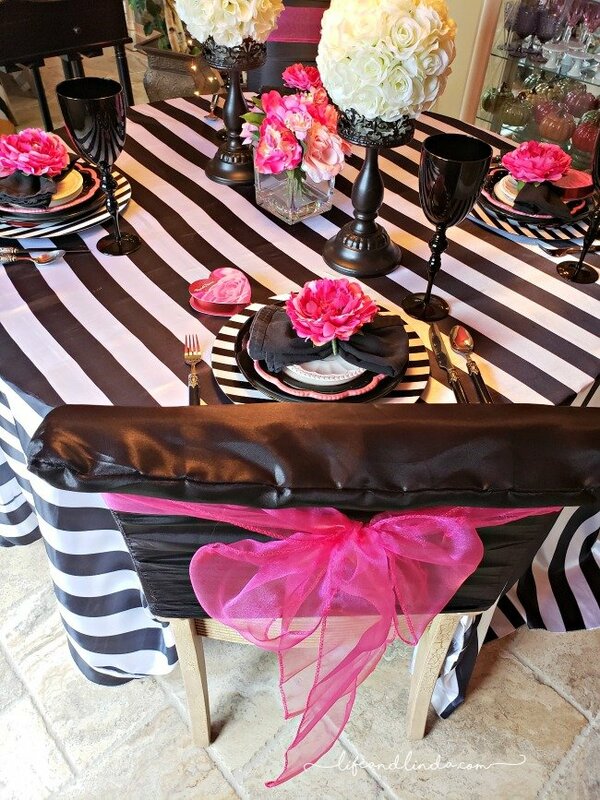 Love the use of black and white and pink and the use of bold stripes in the tablecloth and chargers. Such a contrast between the boldness of black with the delicate pastel of pink. The little Girls Love Chocolate plates are adorable. 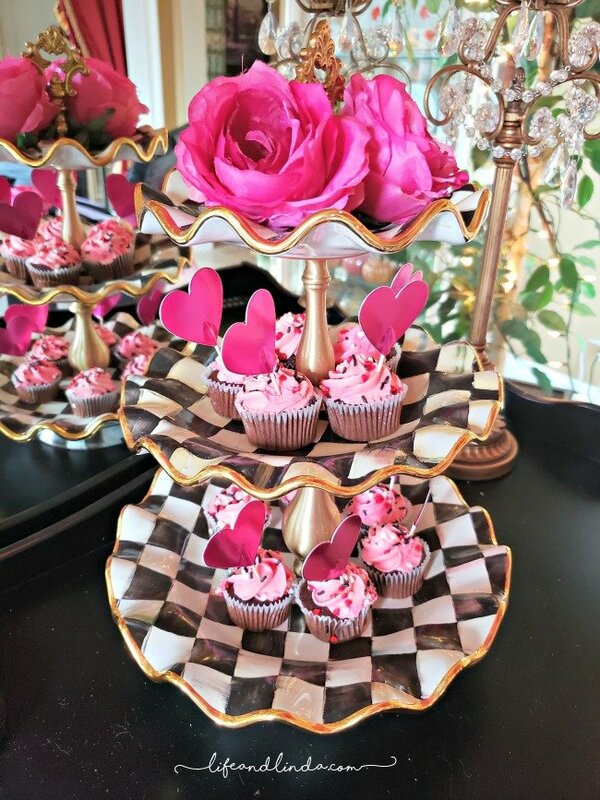 The checkered McKenzie Childs tiered dessert server is gorgeous and filled with those sweet and very tempting cupcakes. Yum Definitely, a "sit up and take notice" table. Kind of like a stunning woman....we like to be noticed when we are beautifully adorned, right? Love the beauty and drama in this table! You clever girl...so glad to be able to call you friend....I love the inspiration you always share. the silk pillow cases are amazing and the right touch. The mix of MKC with pink is perfect and what "gal" wouldn't love to attend this party. You are what these blog hops are all about, daring to think outside the box. Hugs and Blessings. I want to be one of your Galentine's!! This is so pretty. Any Gal would feel like she was in for such a treat to sit at this table! Switched to Safari to comment! It is working as you can see! Thanks! 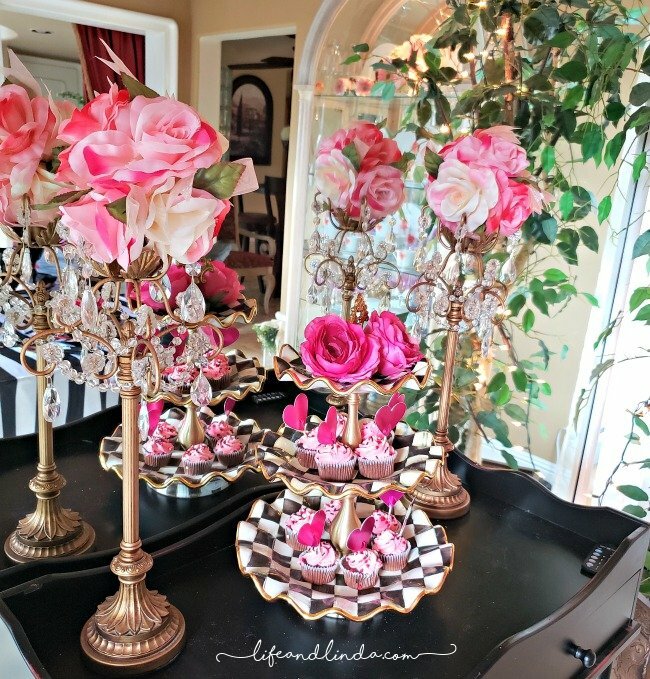 The pillowcases over the chairs, and the MacKenzie Childs dessert stands are just two of my favorite things about this table. Girls love chocolate and I can't imagine any girl who wouldn't love a sear at this table. Beautifully done! 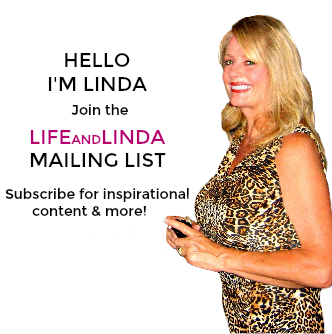 Oh Linda, I love the drama of the bold black, white and hot pink! 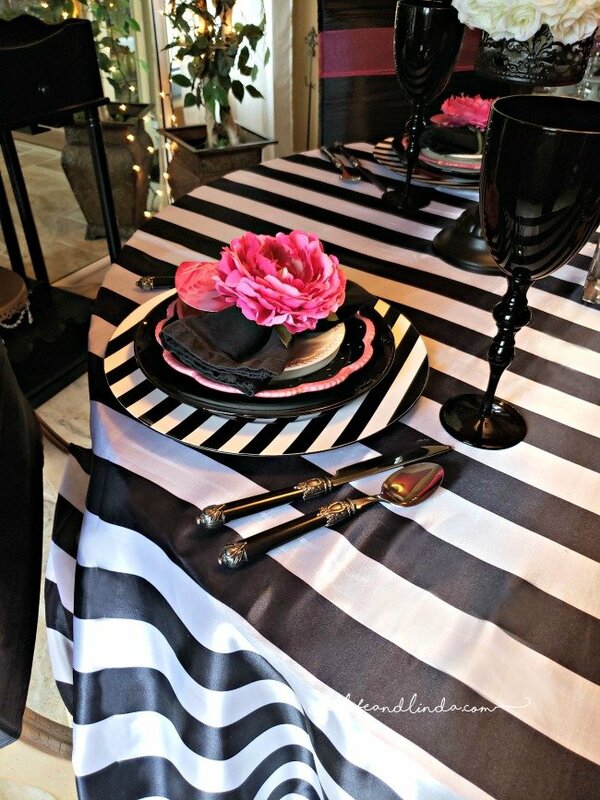 Great minds --- my Parisian table uses a black and white stripe tablecloth too. How very clever and effective using the black pillow cases on your chairs. What a great idea! I always enjoy your table scape posts. They are just gorgeous and this is no exception. Love, love the black and white. I have those same black plates from Dollar Tree. Have a great rest of the week! Linda, your Galintines table is full of black and white goodness. Wish I could fly in and joijn the fun. Love the way the hot pink pops with the black and white! Thanks for sharing the inspiration! Linda, in the photo with your tiered treats with the mirror, are those tall candlestick holders that you put the flowers on? Wish I could join you at your Galentines table! Hi Debbie, thanks so much. Yes, the tall crystal hanging candleholders are holding floral balls. I love using those. They sometimes call them kissing balls or pomander balls. I would love 💕 if you could join us. Linda, love those little plates!! 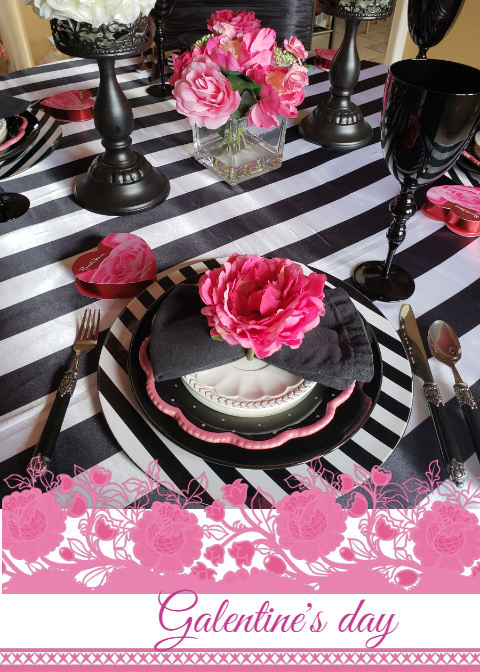 The black and white stripes lend an elegant and dressy vibe to the Valentine table. Love the idea off covering the chair backs with pillow cases ~ great idea. Oh la la, what fun Linda! I love the drama you've created with the bold black and white and hot pink flowers everywhere! What fabulous fun! I want to come to your Galentine's party please!! Oh how I love your tablescapes! I totally agree with Rita that you make Diva Dining Divine! It's so true. Your gift of glamorous is a treat to see. Any gal would feel so extra special dining with you. Linda, you always set the most beautiful tables! This one is gorgeous! I love the drama of the mix of black and bright pink. How fun it would be to dine at this table. Happy Valentine's Day!!! Linda, I love your Galentines table! I love the cute little plates, and yes! I do love chocolate! I also like your pretty Courtly Check servers. Gorgeous setting for a fun party! This is such a fun table, Linda! I love the mixture of black, white, and bright pink. Your attention to detail is exquisite! Happy Valentine's Day! Linda, your Galentine's tablescape make me dream on a très charmant café-patisserie in Paris: so classy! Bravo! Oh my gosh, I want to come, too! 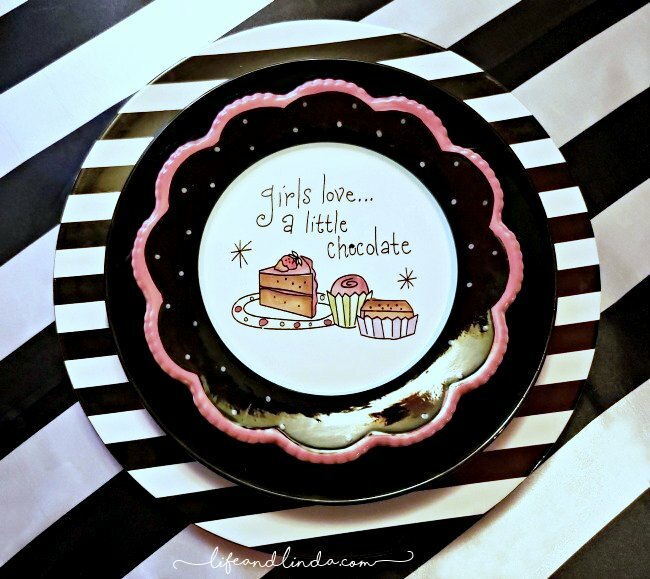 I absolutely love your “Girls Love A Little Chocolate” dishes - adorable! Your color scheme is dead on for a Galentine's party, and your cupcake display has my mouth watering! Beautiful job! Happy Valentine’s Day! Yes girls do love a little chocolate! And they will certainly love this chic and sophisticated tablescape, so perfect for "Galentine's Day!" So many beautiful and elegant ideas here! So happy to join you on the hop. Have a Happy Valentine's and Galentine's Day!